I've got a fairly long form on my page and if someone submits a form with wrong captcha in it, the new captcha is on the very top of my page. I wonder if there's any possibility to make the new captcha appear where the first one was or anything else? P.S. : I need a solution that uses css injection since I don't/won't/can't use the full source code! Anyone out there having an idea? I am afraid there is no way to achieve what you want. Not even customizing the full source code can do it. No offense but I don't quite understand why you'd want it to appear in the same position in the same form if the user enters invalid captcha. Could it be an aesthetic problem? Functionally, I don't see anything wrong with how it is currently implemented. sorry to hear that, thank you for your reply anyways! The clientele filling out our form consists roughly 80 % of mothers. We expect about one third of them are not that familiar with PCs and internet (sounds a bit odd, I know). So if they type a wrong captcha I fear they could be like "What the hell... where Is my form? Maybe it submitted it already!". That's the reason I tried to implement something to avoid them not realizing they did a mistake and have to type it again. Wow thanks for explaining! Putting myself in the shoes of your clientele base made me perfectly understand why you're trying to change the way the captcha page looks. With that in mind, I have submitted a request ticket to have the captcha confirmation page modified to make it more obvious to the submitter that the filled out info was 'saved' and that he/she just needs to enter the captcha correctly to have the form submitted. I am not sure though if our devs would allow the form to return to the filled out form when the captcha entered is incorrect. We'll see about that. Anyway, I cannot guarantee a specific date as to when this request of yours will be granted, if at all. Our development team have been very these days, and we are not really privy with their schedules and priorities. We will just notify you if and when this gets completed. Thank you for your patience. Have a great day! I am having a problem with the captcha on the forms on my site because if a user types the wrong captcha key, he/she will be redirected to a blank page which has nothing to do with the site where they were on. I think that this might scare some people a little bit and get to the point of not submitting the form. I would greatly appreciate if you could get this fixed. Hi, unfortunatelly, the request for this feature is still not implemented. Our dev team will post us an update once they reached this in feature request lists. I can offer a suggestion though, to at least ease on the difficulty of the implementation a bit. What I did was anticipate the next process on the form and readily provide the form users a hint or helpful context to assure them that everything is working on the form. 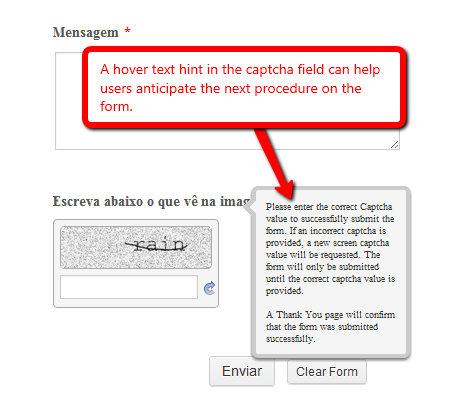 I created a hover text on the captcha field that can be easily seen, and provide information about the form procedure. I made use of your form as sample by cloning it. I also made the form width bit smaller (400 only) to make sure that the hover text will be on top of the captcha field when a user will be filling it uip. Hope this help in any way. Please inform us if you have any other inquiry. That is definetely a good idea, but i would really prefer to disable the Captcha until a definitive solution comes up. So i need to ask, is there any way to disable the Captcha without building up a new form? As far as i understand i can also build up a form from a given url but i would have to still download all the files and it will probably change the way that i have the site at the moment, meaning that i might have to waste more time with this project. I ve been here adding and deleting lines from the jotform.js file but i dont seem to get it right. Is there any way you could provide me with a line or tell me how should i disable the captcha function? The problem is that i am already on the deadline to put this project ready. Hi, can you also please provide us details about your form like its ID# and the URL of the website where the form was used. May I request also that we create a separate topic for this. Please use this link on your next reply. This is an old thread with an attached ticket to it already relating to its subject. Will await for your update.